Please see below for the NAP4 Report, which is intended for medical staff, allied health professionals, medical managers and policy makers and the public. The full report is available either as a single PDF or split into three separate sections. The full report was downloaded more than 26,000 times in the first four months after launch. 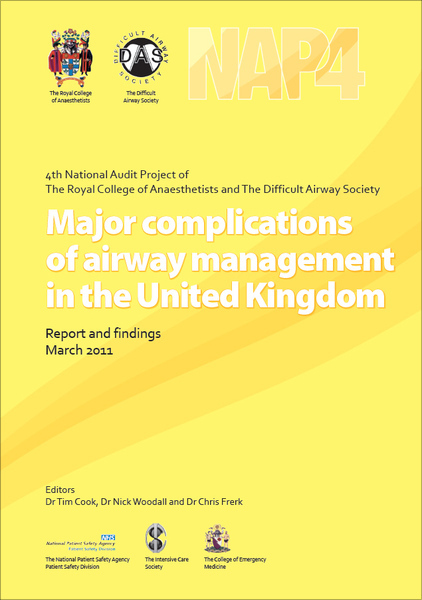 NAP4 was led by Dr Tim Cook and Dr Nick Woodall. The NAPs now have a national and international profile. NAP3 and NAP4 were successful in getting all NHS hospitals to agree to participate. Perhaps uniquely, all these hospitals contributed data to NAPs 3 & 4 enabling the results of the projects to be considered truly representative of UK practice. 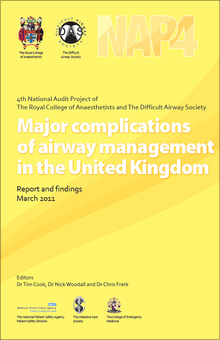 Papers resulting from NAP4 published in the British Journal of Anaesthesia.